Each graph can be divided into several phases by setting the phase numbers on components. You can see this phase number in the upper left corner of every component. The meaning of a phase is that each graph runs in parallel within the same phase number; i.e. each component and each edge that have the same phase number run simultaneously. If the process stops within some phase, higher phases do not start. Only after all processes within one phase terminate successfully, will the next phase start. 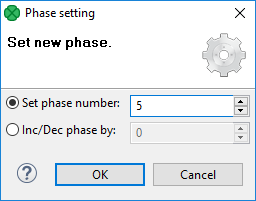 That is why phases must remain the same while a graph is running. They cannot descend. So, when you increase some phase number on any of the graph components, all components with the same phase number (unlike those with higher phase numbers) lying further along the graph change their phase to this new value automatically. You can select more components and set their phase number(s). Either you set the same phase number for all selected components or you can choose the step by which the phase number of each individual component should be incremented or decremented. When assigning phases to individual graphs, you should consider an increment by a number higher than 1 (e.g. 5, 10, 15...). This way, you can later add phased graphs in between two phases, without a need to adjust all consecutive phases.